Building the Aurora monster model kits was wholesome fun for us ’60s kids, glue-fume highs notwithstanding. Early one cold Saturday morning, my dad gave me a Hunchback of Notre Dame model out of the blue. (He got it from a guy called “Slim,” who always had a truck filled with, ahem, remainders.) My dad unceremoniously handed the model kit over and said, “Here you are. You go for this stuff.” With a touch of guilt, I recall wishing the model was a cooler monster, like Frankenstein or Dracula. But then, of course, I fell in love with the Hunchback. I painted it, built it and would just stare at it. The Hunchback was my entre into the world of Aurora. I later built Dracula, which was hard to glue because of his cape and that gnarly tree. Of course, the Phantom of the Opera had that poor dude behind bars with the rat bites all over him — the unluckiest dude in the world. (What was his crime? Did he sing a bum note during a Phantom-composed aria?) Anyway, following are excerpts from the “Monster Mash” section on the Aurora models. From the overview on Aurora: When, in 1960, the Aurora Plastics Corporation of West Hempstead, Long Island — manufacturers of car and airplane model kits since 1952 — conducted its first-ever survey to determine what new kits might attract customers, the answer surprised them: monsters. That old bugaboo, fear of parental outrage, gave Aurora pause. The story, whether veracious or embellished over time, goes that the company consulted psychologists on the issue, and said psychologists suggested monster models might even be a healthy thing for kids. Famous Monsters publisher James Warren said he, too, pushed the idea to Aurora. “I sat down with them and they saw what I was doing in the magazine,” Warren said. “I told them that if they would come out with model kits of Frankenstein, Dracula, the werewolf, the Mummy, the Creature From the Black Lagoon — these would be phenomenal. They were skeptical. They looked at me like I was crazy, because they didn’t know what I knew. Because I knew what was out there. I knew my customers. 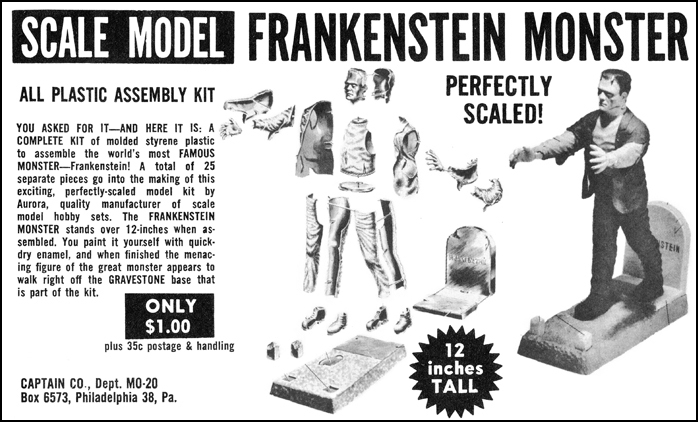 Aurora put out its first monster kit, Frankenstein, in 1961. Artist James Bama, then a paperback cover specialist, painted the box art. The sculpture of the figure — which favored Boris Karloff’s rendition of the monster (though Bama’s art was more Glenn Strange-y) — was true to Aurora’s exacting standards. The cellophane wrapping made you wonder all the harder what lay within the box. The Frankenstein kit, which generally sold for 99 cents, was an instant sensation. At the Aurora factory, overtime and extra molds were required to keep up with the demand. 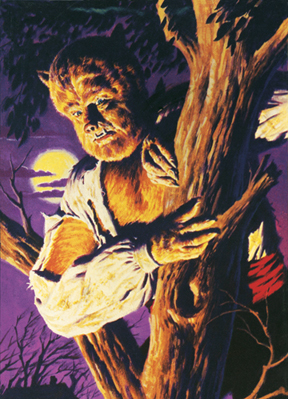 More monster kits followed: Dracula and the Wolf Man in 1962; the Phantom of the Opera, the Mummy and the Creature From the Black Lagoon in 1963; the Hunchback of Notre Dame, Dr. Jekyll “as” Mr. Hyde, King Kong and Godzilla in 1964 (the giant monsters were larger sets, at 50 cents more apiece); the Bride of Frankenstein and the Witch in 1965; and the Forgotten Prisoner of Castel-Maré (an FM original) in 1966. For we pint-sized consumers, the painting and glueing of monster models yielded rewards beyond merely having something cool to put on your bedroom shelf. No further proof of the popularity of Aurora’s monster model kits was needed than the cover of Mad magazine #89 in 1964. In a painting by Norman Mingo, the Frankenstein monster is depicted putting together a model of … Mad mascot Alfred E. Neuman.